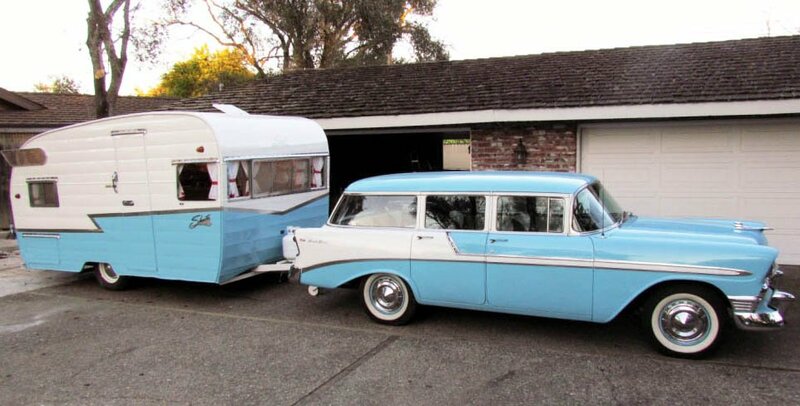 A sneak preview of the upcoming exhibit 'Camping in Style: Little Homes on Wheels'—a 1959 Shasta paired with a 1956 Chevy Bel Air. They're tiny homes for sure. But unlike the prison-like mini-apartments in San Francisco that go for $1,750 a month and attract work-all-day-and-all-night young techies, the vintage travel trailers on display at the California Automobile Museum are all about pleasure. "The idea is, the automobile was getting you from place to place. People early on decided it would be a good idea to take their home on the road with them," museum curator Carly Starr says, relating the history of the trailer, which emerged on the scene in the 1920s but hit it big during the Depression. "Airplane technology was being used in the design of these trailers. For a while people thought that trailers might become the way a lot of people would live." "But people began buying them for pleasure." The exhibit, 'Camping in Style: Little Homes on Wheels,' runs October 31 to April 10 at the museum, which also has a marvelous permanent collection of vehicles. The museum is open 10 a.m. to 6 p.m. every day, with nighttime hours the third Thursday. Many of the vehicles come thanks to the efforts of Vintage Camper Trailers, a trailer group that restores and preserves vintage trailers, and publishes a magazine on the subject. They sent out word that trailers were needed. Most of them are coming from the Sacramento area and from the Sierra Foothils. On display will be ten full-size trailers, from the 1930s to the start of the 1960s, ranging from 15 to 22 feet long, and two smaller 'teardrops,' so described because they are shaped like tears. They are amazingly diverse, from Buck Rogers-like creations to the Shasta Airflyte, "the iconic 1950s trailer," which will be paired with one of the iconic 1950s cars, a 1956 Chevy Bel Air Station Wagon, Starr says. No, you won't be able to crawl inside these attractive trailers—except on two special event evenings, dates to come. But, Starr says, the trailers will be well illuminated from within for easy viewing, and photos of interiors will be conveniently displayed as well. The museum will put on several events for kids and families, with dates to be determined. These will include contests. "I haven't seen them all in person yet, so can't really say which is the favorite," Starr says, but she cites a 1941 design by industrial designer Brooks Stevens. "It's the only one in exhibit that's a motor home," she says. "The 1940 Airflyte is really kind of odd-looking, and I really love that," she says. "It's not the usual canned ham look." After touring the show you just might want a vintage trailer of your own. If so, or you just want to learn more, you can check out Vintage Camper Trailers. As Starr says, "California is the ideal place for trailers. There's perfect weather." And so many places to go. For more on the 'Camping in Style: Little Homes on Wheels,' click here.